Bharal Adventure offers you an irresistible opportunity of your lifetime. We can discover the rough terrain of the snow-capped mountains. We can also discover affluent cultural and religious traditions and lifestyles of the Sherpa villages. In addition, We can achieve mountain wildlife diversities and religious as well as historical sites too. Especially, the magnificent and breathtaking views of the mountain peaks including the Everest can be observed. The finest local luxury lodges available along the trails. Probably, the journey will definitely provide the different dimension to daunting walking in the trail of Khumbu. So, This trek provides you the prospect of embracing the base of the world’s highest mountain – Mt. Everest – standing proudly at 8848m. It is one of the grandest and consummate opportunities to trek in the Himalayas. It was first ascended successfully by Sir Edmund Hillary and Tenzing Norgay Sherpa in 1953. The journey commemorated by indulging in the glorious landmarks in Kathmandu. After that proceeds through the thrilling mountain flight to Tenzing-Hillary Airport in Lukla. Then, an adventurous trek along the steep and rough mountain trails to and fro Lukla – Namche Bazaar – Everest Base Camp followed by the return flight to Kathmandu. Hence, Bharal Adventure organizes this amazing package just in fifteen days. Everest Base Camp Luxury Trek allows the guests to get outstanding views of the mountain and Sherpa culture and lifestyle. This also rich cultural and historical heritages in Kathmandu, the holy abode. Therefore, the journey is planned by the professional mountain team, Guides and experts so you will definitely have lots of adventure. In conclusion, Bharal Adventure assures you the best hospitality and quality services. An excellent 4 star category hotel will be provided for you and 6 nights will be spent in the best available local lodges. Unlike the hotel in Kathmandu and the luxury lodges, the local lodges have shared washing and toilet facilities. All accommodations for Everest Base Camp Luxury Lodge trek are on a twin-shared basis. A single room is also available by paying an additional amount of USD 850. However, a single room is only possible in Kathmandu and the luxury lodges in the mountains. It might not always be feasible in local lodges. The Everest region is stunningly beautiful, but equally fragile. Future generations have just as much of a right to appreciate it as we do. Hence, the tourism industry has an obligation to protect and preserve it. Bharal Adventure employs a 'zero impact' policy on the natural environment and the traditional communities that live at the travelled places. We enforce a number of do's and don'ts. We also work alongside KEEP in order to maintain our environmental concerns. It is a condition upon joining any of Bharal Adventure trips that all clients be insured for comprehensive expenses that might incur due to medical issues or accidents (this includes air ambulance, helicopter rescue, and treatment costs). Please note that we don't arrange or sell insurance. Bharal Adventure’s ‘Everest Base Camp Luxury Lodge Trek’ itinerary is planned with a high degree of awareness of AMS (Acute Mountain Sickness). Going up at higher altitudes too fast causes a medical condition serious enough to result in death. The higher the altitude, the less oxygen will be in the air. For example, at an altitude above of 5000m, there is 50% less oxygen than at sea level. Therefore, our body needs many days to adapt to an environment with less oxygen. Our itineraries generally allow sufficient time to acclimatize. So, for a safe trek, it is absolutely essential to allow sufficient time for acclimatization. Sensible planning is therefore required to minimize the risk of AMS. Bharal Adventure advises guest(s) with known heart, lungs or blood diseases to consult their doctor before traveling. Mild headaches, fever, loss of appetite or stomach disorders are symptoms of AMS. Check out "Altitude illness" by Dr Jim Duff. Bharal Adventure’s itineraries are designed to try to prevent AMS as much as possible. But it is important to remember that some visitors are more vulnerable than others. Bharal Adventure's Everest Base Camp Luxury Lodge Trek is a moderate trek suitable for passionate walkers who have the ability to walk for at least 4-7 hours a day with a light rucksack. In some days we might even need to walk 8 to 9 hours. Walking in higher altitudes is more physically demanding than walking in the lower altitudes; however, if we are in excellent health with average physical fitness, have a positive attitude, self confidence and strong determination, we can accomplish the trek successfully. Exercising and jogging regularly for some weeks prior to the trip is good idea to enhance our strength and stability. Past hiking experience would be an asset but no technical skill is required for this trip. It is important that we consult with our doctor before we decide and set up for the Everest Base camp trek. 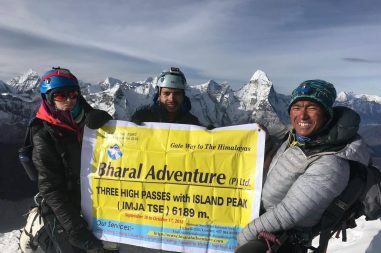 Participants with per-existing medical conditions such as heart, lung, and blood diseases should inform Bharal Adventure before booking the trek. Autumn (mid Sept to mid Dec) and spring (March to May) are the best seasons for this trek. The weather is sunny and warm with outstanding views. But the nights are cold and can fall to freezing level in higher elevations. Winter (Dec, Jan, Feb) is also good for Everest Base Camp Trek, the only issue is cold (obviously). Trekking in summer or monsoon (June, July) will be affected by rain but the summer trek could be a boon for a keen botanist. The trekking routes are crowded during spring and autumn. But during monsoon and winter the routes are not packed and visitors can enjoy the best that nature has to offer. Either a day’s hike to Thame or Khunde villages or exploration of Namche Bazaar could be made for acclimatization. It is the major trading center of the region that has restaurants, ATMs, a bakery and colorful market each Friday evening and Saturday. A visit to Tourist Visitor Center near the Sagarmatha National Park headquarters along with a side trip to Khumjung Valley shall be arranged. After sightseeing and having lunch, the team walks back down to Namche Bazaar. The team treks towards Pangboche and then descends to Kayangjuma. After passing through Sansa, the major trail junction to Gokyo Valley and Everest Base Camp, the team disembarks at Phunki Thenga for lunch and rest. It requires a short tough climb from here to Tengboche followed by an hour walk to arrive at Deboche. After breakfast, a trek through small villages, mani walls and chorten will take the convey to Pheriche. Lunch shall be provided on the journey. A moderate walk to Imja Valley commences from Pheriche. From the valley, descend towards Lobuche River takes place followed by the steepest climb of the day to Dingboche. This day marks the initiation of climb through the Khumbu Khola Valley to Duglha. The valley begins to narrow after crossing Dusa. The team passes through Phulung Karpo, the camp sites during first successful Everest Expedition in 1953 and Chola Lake on their ascend to Dugla accompanied by the magnificent views of Pumori, Nuptse, Cholatse, Thamserku and other peaks. The trek up the steep terminal moraine of the Khumbu Glacier will commence from here. 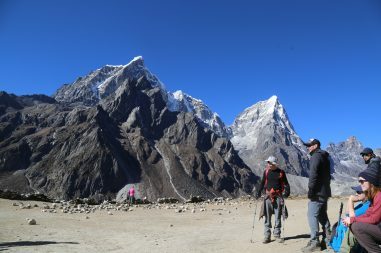 The team passes through Chupki Lhara and memorial grounds for national and foreign mountaineers descending to Khumbu Glacier and mounting again to Lobuche. The convoy arrives at Gorak Sheep through Khumbu Glacier, Thangma Riju and Changri Glacier. 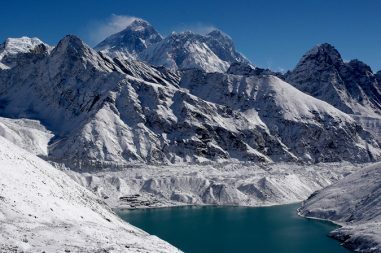 After lunch, it treks through the trail to Everest Base Camp through once vast Gorak Shep Lake. The team returns to Gorak Shep for the night and those wishing to ascend to Kala Patthar are escorted by guides and Sherpas. 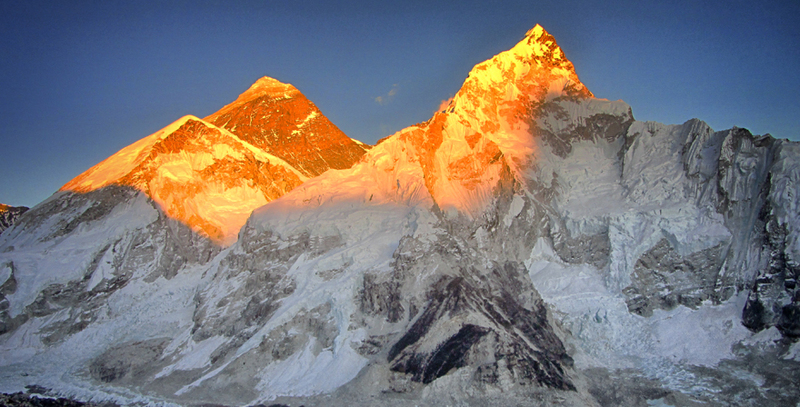 The several hours ascend to Kala Patthar sets off before the first day light breaks. Upon the return to Gorak Shep, breakfast is served. The team visiting Everest Base Camp on this day will have early breakfast and start their hike. After the return of both teams, lunch shall be served at Gorak Shep and descend to Pheriche sets in motion. The team boards an early morning flight from Lukla to Kathmandu where the day is spent either relaxing or shopping for souvenirs (Nepali handicrafts). A farewell dinner is hosted for the team to rejoice the successful completion of their voyage. After swapping emails, photos and pleasantries and having breakfast, a representative from Bharal Adventure sets off to drop the guests to the airport approximately three hours before their scheduled flight.